Energy & Resources GroupKRIPA JAGANNATHAN – Winter is Here: Are We Ready to Adapt? TITLE: Winter is Here: Are We Ready to Adapt? With societies worldwide already beginning to face the impacts of climate change, there is an increased urgency to design and implement adaptation measures that are informed by robust climate science. However, despite advances in climate science and modeling, the actual use of climate information in adaptation plans and actions is still very limited. My research aims to examine and address the mismatch between climate research and decision-makers’ information needs. In this talk, I explore the ‘usability’ of current climate science for adaptation, through stories of 3 potential users: a farmer, a farm advisor, and a water manager. These stories describe their needs, perceptions, and experiences related to climate science. I will then conclude with recommendations on how we can move towards bridging the gap between development of climate knowledge and its use in adaptation planning. Kripa’s research interests are in the field of climate change adaptation and climate-resilient planning. Her PhD focuses on improving the ‘usability’ of climate science for adaptation decision-making. She is currently working at Lawrence Berkeley Lab to assist in designing and managing a large ‘co-production’ project, where scientists and water managers are jointly developing decision-relevant climate science. She also collaborates with UC Cooperative extension and USDA’s Climate Hub to examine the types of climate information that will promote on-farm adaptation practices. 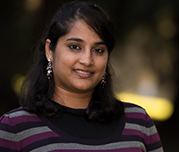 Prior to her PhD, Kripa worked in sustainability consulting for over 7 years. As a manager with PricewaterhouseCoopers India’s climate change team, Kripa lead project teams on various technical advisory projects including emissions reduction efforts, carbon mitigation strategies, and adaptation plans & policies.